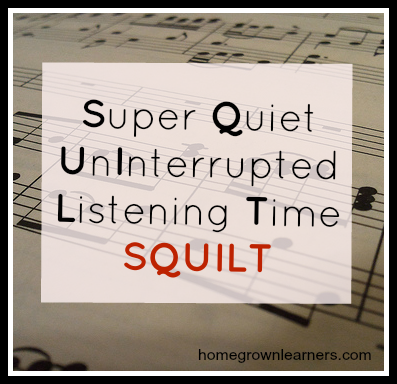 This SQUILT lesson is dedicated to all those superheroes out there. If you're new to SQUILT, it is a way to ensure your children have quality music at least once (or more!) each week. It is a way to build listening skills, a critical ear, and attention. It gives your child a repertoire of great music. No piece of music is more epic for a little (or big) superhero than the theme from Superman. This post contains affiliate links. Please see my Disclosure Page for more details. This march was composed by John Williams for the Superman movies (1978-1987). The march is used in the beginning of all of the movies except the third. John Williams has written scores for 75 films, and his music conjures up so many great images for all of us. My children love studying his music - he is one of the great composers of our time and it's important our children know about him. If you aren't familiar with the format of a SQUILT lesson, please visit the very first lesson to find out more. *You can also visit my SQUILT website to get more SQUILT lessons for your children! Review each of the four elements of music: Dynamics, Rhythm/Tempo, Instrumentation, and Mood. I have described them briefly on the SQUILT sheet. Listen to the Theme From Superman on YouTube (note: I am always very careful on YouTube. The content of this video is fine, but sometimes comments on videos are not so nice. I never let my children surf around on YouTube alone. Remember, this first listening is done eyes closed, just getting a first impression of the music. Don't require any writing and don't allow talking. You want to develop your children's listening skills. After the initial listening, have your children tell you what they heard. Some children will talk automatically about the music itself, while others will talk about specific things in the music. ANYTHING GOES! You simply want your children engaged with the music. Play the music again for your children, this time allowing them to fill out the SQUILT form while listening. You can talk with them about the elements of music this time. Dynamics: This piece has a wide range of dynamics. Encourage your students to use the technical terms for dynamics (see lesson 7 for these terms). You will hear that the piece is divided into three distinct parts (ABA). The A section is the most familiar, march like section. The B section (beginning at 2:17 in the above video) is more slow and mostly strings. The piece ends with a return of the A section (at about 2:52 in the recording). The B section is softer. Emphasize this for your children. Rhythm/Tempo: The rhythms in this piece are repeated and characteristic of the march. Children can point out the same rhythm is used over and over (again, talk about ABA in the piece). The tempo in the beginning is slow and majestic - then speeds up. The beats are grouped in sets of 4. You can count "1-2-3-4" out loud with your children to demonstrate this. Instrumentation: This is scored for a full symphony orchestra. Have your children listen for all 4 families of the orchestra. Here is a great website to help them learn about the families. Kids are naturally drawn to the percussion in this piece, so it might be fun to talk in detail about the percussion family. Mood: So many adjectives can be used to descripbe this piece. The sky is the limit! If your children are familiar with the Superman story, how does John Williams use this music to convey the mood of the story? Older children can explore this subject more deeply - how does a composer write music to reflect their feelings or events going on around them? My little guy loved learning to read with the I Can Read! books. Why not supplement a study of superheroes with some reading? And of course we have to include some LEGO fun, too! There are MANY more superhero LEGO sets, too - way too many to list! Do you have a superhero in your house that would love these activities? I'd love to hear about how it goes with them. I also love to receive pictures of children using the SQUILT lessons!